What to expect when you’re expecting … to travel with a toddler! No more “free rides” for your child on domestic flights, most cruises, and rail travel in the U.S. and Canada, though kids continue to ride free on trains throughout Europe. Most child-oriented attractions will charge admission for your 2-year-old as well (although Disney Parks and Legoland Parks don’t charge for children under 3 years). We all have our favorites, and that goes for your child now, too. She begins to express her own opinions about everything from food, to wardrobe, to activities, to whether or not she approves of getting into the car seat. The more involved and empowered you can help her feel through this phase, the more smoothly your travels are likely to go. Small steps along the way, like choosing which books to put in the carry-on, or which pajamas to wear at Grandma’s house, could help her feel much more in control of the changing situation. Since tantrums may erupt for even the best-behaved little travelers when stretched too thin, you may all be happiest in vacation settings where these can be managed as safely and effectively as possible—and avoided as much as possible. A vacation that allows for flexible daily schedules, regular meal times and snacks, and physical freedom and activity for your child can be critical at this stage, so most beach vacations and camping trips will fit the bill nicely. Urban adventures, where parks and playgrounds are easy to come by between other sightseeing activities (e.g., New York and Paris) can also be helpful. This could also be a great year to travel by train, with your child free to explore the train cars with you, not constrained in a car seat. Since she rides trains for half the adult fare in the U.S. and Canada, and for free in Europe, it may be less expensive for your family to travel by train than by airplane on some routes. See Part VI of Travels with Baby, Travels by Train, for help planning rail travel in the U.S., Canada, and throughout Europe. Some children give up their afternoon (and final) naps this year, making it all the more important to have an early bedtime. 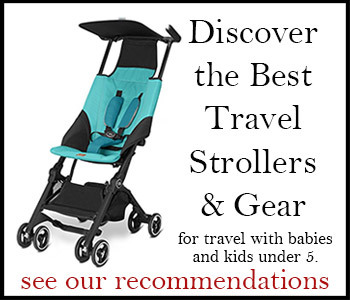 During travel, however, with the help of a physically active morning (e.g., swimming in the hotel pool or romping on the beach) followed by a ride in the stroller or long drive, these kids may still catch some winks. Plan your itinerary accordingly. Potty training may be a big theme for your household this year, so be sure to plan your itinerary accordingly, and be prepared for surprises (see Pottying on the Go, pg. 98). Longer flights become a little easier for most children as the year passes and your child’s attention span allows for more reading time, some basic games, coloring, and other pastimes. Beach vacations (get ideas for where you’d like to go in our Family Travel Destinations and see Chapter 2: Deciding Where to Go of Travels with Baby for more beach vacation advice), camping trips (click here for more help planning camping trips with babies and toddlers), and train travel (see Part VI: Travels by Train in Travels with Baby for help planning train trips in the U.S., Canada, and Europe). Little legs needn’t dangle down that long and winding road. Let’s hear it for car trips in comfort!